The 12th anime film of the long-running franchise was previously screened in local cinemas in 2013. Terrestrial broadcaster GMA Network has announced on Wednesday that the anime film One Piece Film: Z will be airing starting this Saturday. The anime film will premiere on April 6, airing every Saturday mornings at 09:15am, right after the animated show Ben 10: Alien Force, which will air nationwide on its flagship free-to-air channel. The 107-minute film will be split into several parts, which will be airing on the 30-minute timeslot for the next couple of weeks. 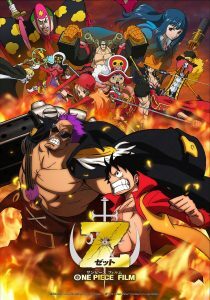 One Piece Film: Z is the 12th anime film based on the popular manga series by Eiichiro Oda, which has been running on Shueisha’s Weekly Shonen Jump magazine since July 1997, and currently has 92 volumes. One Piece Film: Z is directed by Tatsuya Nagamine, who previously worked in Beet the Vandel Buster anime series, while Love*Com the Movie scriptwriter Osamu Suzuki handled the screenplay. Masayuki Sato, who previously worked on several of the popular franchise’s film adaptations, returned to work on the anime film, which was produced by Toei Animation. Philippine film distributor Pioneer Films previously screened the anime film in Philippine cinemas in Original Japanese Audio with English Subtitles in May 2013. GMA Network previously aired the anime film’s sequel, One Piece Film: Gold, on the 30-minute morning block from March 12, which aired its fifth and final part last March 30.